Some novels grab you by the shirt collar and yank you in. Others walk away with little more than a coy glance over the shoulder, trusting that you’ll follow. 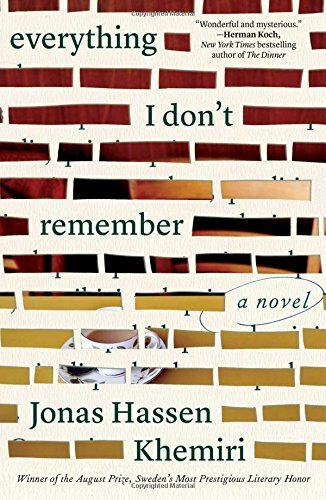 Everything I Don’t Remember, written by Jonas Hassen Khemiri and translated into English by Rachel Willson-Broyles, is, without question, of the latter variety. Winner of Sweden’s prestigious August Prize when it was first published last year, Khemiri’s novel is the story of Samuel, already dead as the book begins, told by various people who knew him in brief snippets of interviews conducted by an unnamed novelist trying to answer the question of whether his death, the result of a single-vehicle crash into a tree, was an accident or a suicide. Khemiri gives the reader little to go on, and it is at first difficult to determine who is speaking. Additionally, there are contradictory statements made by the various interviewees, making it impossible to know how much truth any one person is delivering. Yet eventually a picture of Samuel emerges from the fog as his friends and associates talk about their histories with him, a picture of a contradictory man who was a loving, if frustrated grandson; a loyal friend; a private man who relied on historical facts and random factoids during conversation to deflect from himself; and a reluctant bureaucrat. Those being interviewed include Vandad, Samuel’s one-time roommate and a criminal heavy, a collector, who may have been in love with him; Laide, who had a year-long love affair with him; Panther, a childhood friend; and Samuel’s mother, among others. The story jumps backward and forward in time, forcing the reader to piece together the timeline, which adds to the uncertainty of the storytelling. As an example of narrative technique, Everything I Don’t Remember is an impressive piece of work, and one senses that the novel is exactly what Khemiri intended it to be, which is a feat in itself. The translation is smooth and natural, making the novel read as though it were written in English, containing none of the stiff, formal prose that scars many other translated works. That said, Everything I Don’t Remember is hardly an “entertainment,” as Graham Greene called his thrillers, and is as easy to put down as it is not to pick up. It contains very little of the tension that might make it a page-turner. Despite this there are rewards to be found here. After the first hundred pages or so, the characters come into focus and begin to take on life. Samuel himself becomes the real mystery, whether his death was an accident or suicide being almost beside the point. Patient readers, those who care more about character and theme than they do about straightforward storytelling, will find the book well worth reading. Those who want an engaging mystery or thriller without much in the way of literary trickery will, with few exceptions, find themselves disappointed. Ryan David Jahn's first novel, Good Neighbors, won the Crime Writers' Association John Creasey Dagger in 2010. His most recent novel is Dark Hours.